We knew failed adoptions were real but we thought we were invincible. So, I guess when ours happened it hit us hard. We thought how could we go on, do we even adopt, why us? But when we opened up more about our failed adoption we realized how common these are. Now a failed adoption doesn’t mean that you sent in our profile to a birth mom and weren’t chosen. A failed adoption is when you were matched with a birth mom and she decides to parent. Whether it was a little after the match was made or right after the baby is born. (I felt like I needed to clear the air on what it specifically is) As hard as it is, it is common around adoptive families. Advice: don’t think your invincible, and talk about what you would do in that circumstance so you are ready if it were to come. But let me tell you, you do recover from it, it just takes time. As soon as we got our Lemmon, friends, family, followers, strangers, ANYONE really, was popping up telling us about how close adoption is to their lives. We couldn’t believe it! We still get it to this day and we love hearing how their lives have been blessed because of it. We’ve relied on these people many times when we hit some bumps in Lemmon’s adoption. I’ve called up friends or family and asked their advice with an adoption situation and it’s helped so much. If adoption is close to you, open your mouth! Because people have opened their mouth to us, Lemmon now has so many people to turn to and relate to. Thank you! 3. Legal Adoption and Emotional Adoption Don’t Always Happen At The Same Time. And There Is Nothing Wrong With That. This goes for both side of the adoption. Riley felt like he didn’t fully connect with Lemmon till she could start interacting more (3-6 months). He loved her so much but the bond for them two didn’t start till later. And that’s okay! It was so comforting to have our social worker meet with us every few months and go over the bond we were having with Lemmon. She reminded us that it takes time and if you do all you can then the bond will come. I can’t fully speak for our Birth Mom, but we would receive text from her right after the adoption checking in on Lemmon (we personally loved it) She knew it was done legally but emotionally, she wasn’t ready to go. AND THAT’S OKAY! Embrace it! We thought we had it all figured out. We talked with our birth mom on the phone before Lemmon’s birth and asked lots of questions. We knew we wanted to get her a gift to give to her when we all left the hospital. We went shopping for her a few times and had our cart full of pampering stuff, clothes, food, etc, but always ended up putting it back. We decided to just wait till we got to New Orleans. After being with her for a few days, we understood a little more of her personality. We asked more in depth questions and felt more at comfortable face to face. We decided to get her something that we thought would mean more. The look on her face when we gave her her gift was priceless. We wanted it to mean something and it did. Wait to get to know your birth mom face to face if you can and if you can’t, pray that you’ll understand a little more of who she is. We just assumed we knew so much about her after one phone call. No one told me that part. I knew, of course, that we would have to say goodbye to our birth mom, our angel. But I didn’t know how hard, sad, heart wrenching, emotionally draining it would be. I wish I hugged her more. I wish I thanked her more. I wish I cried of gratitude in front of her more, rather then in the hallway. I wish I had pictures of all of us parents with Lemmon. But Mostly, I wish I hugged her more. Nothing can compare to that goodbye. Take the hardest saddest moment in your life and times it by 1000. But the most amazing thing is, you recover from it. I didn’t know if I would or how I would share that part of Lemmon’s adoption with her. But I’m confident that that will be the most memorable part of Lemmon’s adoption. "6 Ways To Cope With Infertility"
"How To Pack For A Toddler"
you write a awesome and excellent post. Really awesome and superb post, thanks for sharing. 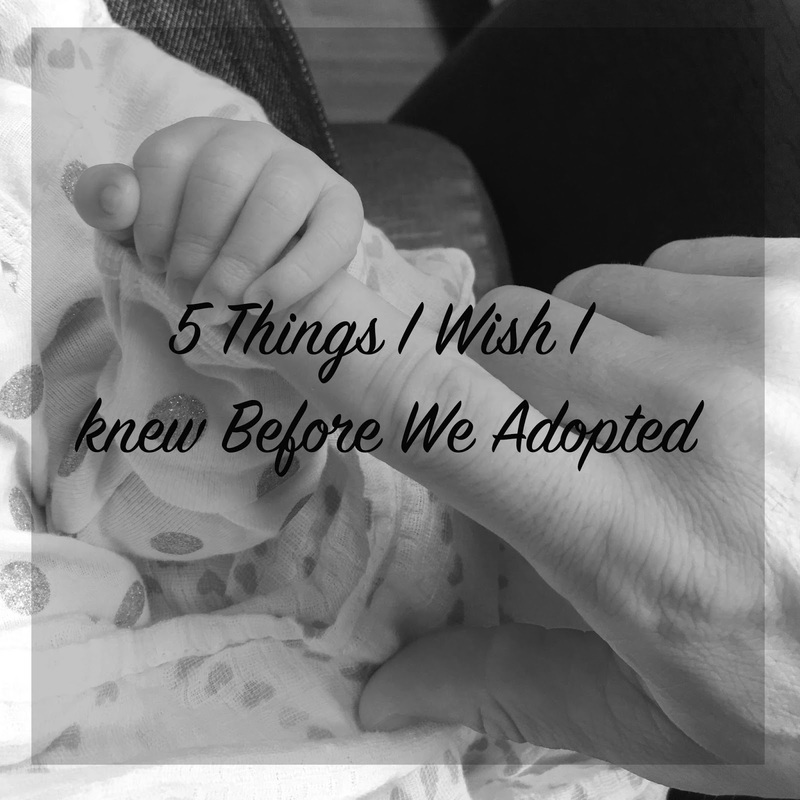 nice and superb post regarding "5 THINGS I WISH I HAD KNOWN ABOUT ADOPTION"